Founded in 1997, Brewery Ommegang has been bringing Belgium to America with resounding applause. Designed with a traditional Belgian farmhouse in mind and built over a former hop farm in Cooperstown, New York, all of Ommegang’s beers are brewed with traditional Belgian ales in mind, courtesy of Belgian beer exert Don Feinberg. With the enormous success of HBO’s fantasy epic, Game of Thrones, a beer-and-TV-show partnership could have easily ended up in the hands of an unsympathetic conglomerate. To our great fortune and excitement, Brewery Ommegang took the helm of crafting beers based on our favorite fantasy show. Tonight, nearly eight years to the day after the first episode of Game of Thrones premiered on HBO, its final season begins — bringing back Arya and Jon, Dany and Tyrion, and some dragons that are ready to cause a ruckus. And while there are only six episodes this time around, expect those episodes to be longer — between an hour and 80 minutes each — and really pretty, considering HBO dropped $90 MILLION on this single season. In celebration, Peaks and Pints presents a flight of GoT-inspired beers that we call Craft Beer Crosscut 4.14.19: A Flight of Game of Thrones. 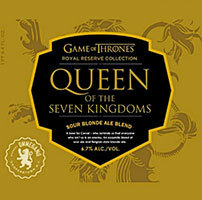 Queen of the Seven Kingdoms, the second in a series of four special, limited release beers, each designed and brewed as an homage to one of four epic figures in the battle for the Seven Kingdoms, is brewed and blended for Cersei Lannister. A blend of Belgian sour ale and Belgian-style blonde ale, Queen of the Seven Kingdoms is fitting for the fair-haired ruler who is as acerbic as they come. Aromas of melon, citrus, and lactic acidity meld together with fruity esters from the Belgian yeast. Tart citrus flavors soften to sweet malt flavors with notes of apricots. The finish is dry and crisp with a subtle citrus bite from the lemon peel. Even the most devoted Game of Thrones fan has to admit that the popular HBO series relies on a number of fantasy tropes: dragons, sword fights, particularly unfortunate weddings. Make the frequency with which breasts are bared and the Lord of Light is invoked work for you by trying your hand at Ommegang’s Mother of Dragons. 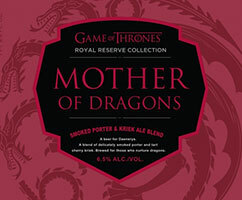 That’s right, Daenerys Targaryen’s cute dragons are back as a blend of a smoked porter and a Belgian kriek representing, “the smoke and fire that Daenerys has unleashed on her opponents during her ascent to conquer and rule the seven kingdoms,” according to Brewery Ommegang hype. Is a horny, Reddit obsessed 14-year-boy running Game of Thrones? Ponder that as you sip this rich brew with tart cherry up front leading to a center palate of semi-sweet chocolate, subtle smoke and mild sweetness. Just 20 short years ago Jason Spaulding and Brett Vander Kamp were lining up investors to get started on their goal to make beers that were unique to Western Michigan. Eleven years later they were making more than 7,500 U.S. barrels a year at their New Holland Brewing Company. 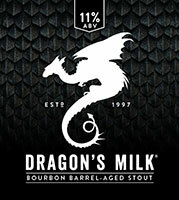 Dragon’s Milk, a year-round staple at the brewery, has long been a favorite of New Holland fans. First brewed in 2001, the stout uses two row, Munich, caramel, crystal, black, chocolate malt, and flaked barley grains along with glacier and nugget hops to achieve its roasted, malt character. It’s also made with Michigan beet sugar and aged for more than 90 days in oak bourbon barrels that give it its signature flavor. Cooperstown, N.Y.-based brewery Ommegang released a new Game of Thrones series named the Royal Reserve Collection, which is “a collectible series of four special, limited release beers, each designed and brewed as an homage to one of four epic figures in the battle for the Seven Kingdoms,” according to Ommegang hype. 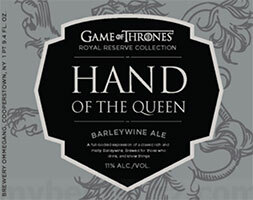 The first beer in the series, Hand of the Queen, is an 11 percent ABV barleywine brewed with “a blend of specialty malts and carefully-selected old-world hops” that is a tribute to the Tyrion Lannister character on the show. 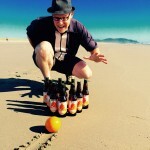 Contrary to the violence on the TV series, Ommegang Game of Thrones – Hand of the Queen is not a punch in the face over the top barleywine, but a subtle and complex beer, that begs to be sipped. The nose is toffee, dark fruit, leather and light yeast. Very light chocolate, too, in the flavor with a light sweet caramel, molasses, vanilla bourbon, light brown fruit and faint hints of leather and tobacco. 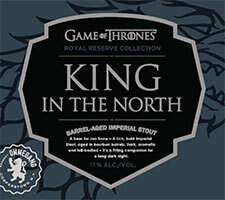 Ommegang’s King in the North, a beer brewed for Jon Snow, is the fourth and final beer in this year’s Royal Reserve Collection. Brewed to sustain a leader through a long, dark night, King in the North is a barrel-aged imperial stout with aromas of roasted malt, coffee, and chocolate blend with those of oak, bourbon, and vanilla. The flavor is rich and full with notes of chocolate, vanilla, coffee, and roasted malt up front followed by smooth bourbon and a hint of oak. The finish is thick and chewy with oatmeal creaminess, and pleasant lingering roast.